In order to cook great quick vegetarian food for my family I rely on a well-stocked storecupboard. My approach to nutrition is to try to eat a wide variety of foods — it’s like placing a bet on every single horse. I find it really useful to have my ingredients organised and use glass jars for lots of the ones I use everyday. After a busy winter, I often find I need to have a rejig and refresh. Now is a brilliant time of year to replenish them. Over the next few weeks I’ll be sharing a fairly comprehensive list of the ingredients I like to have on hand. This is the first in a three-part series. When I’m organized, I’ll cook a big batches of dried beans and freeze individual-sized portions so I know they’re homemade and as nutritious as possible. I always try and soak them first. If I don’t manage to cook them myself, I keep a few jars of slow-cooked beans on hand. The jarred Spanish ones are the best and bear no resemblance to the sometime bullet-like canned ones. They are pricier, but worth every single penny. Nuts find their way into most of my cooking. I buy unsalted, unroasted nuts and store them in jars in the fridge of there is space as they keep longer if not on a cool shelf. I try to eat them soaked and raw, as that way you get maximum nutrients, but if I’m toasting them I do them in little batches as I need them, as toasted nuts go off much quicker. Always use nuts within a couple of months. After that their oils can go rancid and they taste bad. I usually keep a couple of different nuts on hand – cashews, almonds, pecans are my favourites. Dry pasta lasts for ages, and in my mind, if you have a pack of pasta, then you have a meal. I buy a lot of De Cecco but there are lots of good brands. Lovely nutty flavour and gluten-free. Subtle in flavour, making it a perfect replacement for those going gluten-free but wanting the same flavour as normal durum wheat pasta. Keeps a nice bit of bite when cooked and has a higher protein content than regular noodles. Seeds are a powerhouse in my kitchen, adding depth to morning smoothies, richness to soups and even forming the base of creamy dressings. And they’re often cheaper than nuts: my staples are sunflower, pumpkin, sesame and poppy. I buy them in bulk bags, use some to make a seed butter (quickly roasted then blitzed – sometimes mixed with some nuts too – for a spread worthy of toast); I roast them with maple syrup, chilli and rosemary for these snacking seeds, perfect for sprinkling on salads, roast roots or simply for eating by the handful. 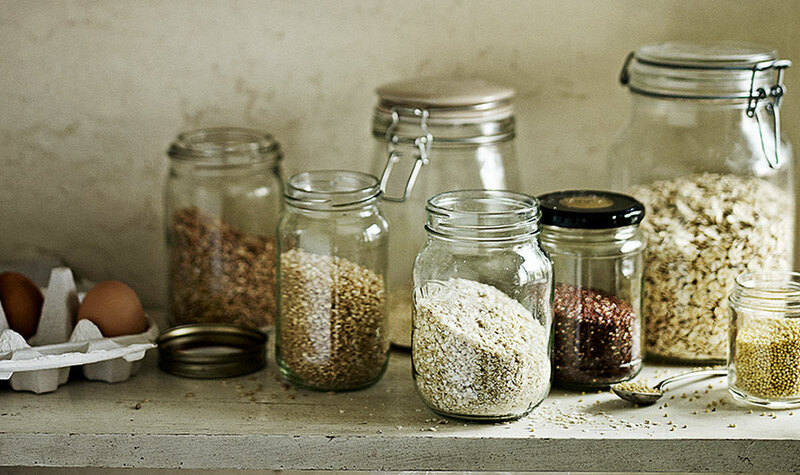 I keep the bottom shelf in my kitchen stocked with jars of different grains like quinoa, bulgur wheat, rice and barley, and eat them throughout the week. Just like with fruit and veg, it’s important to vary the grains you eat, too. Each grain has a different flavour and texture and provides your body with different vitamins and nutrients. Quinoa is often grouped with whole grains but it is actually the seed of a plant that is a relative of leafy green vegetables such as spinach and Swiss chard. It is really high in both protein and fibre, with the added bonus of containing no gluten and almost no fat. The amino acids in quinoa mean that it is a complete protein and is a really good choice for upping your protein intake. The red, pink and black versions are delicious too and can be found in most health food stores. I love the Hodmedod’s one. Teff’s other name is lovegrass, which I like. It comes from Ethiopia, where it is often used to make sourdough injera breads and in stews. It is the tiniest of grains, the size of a poppy seed, and its name literally means ‘lost’. For a tiny grain it provides a massive amount of nutrition. It is very high in protein and is said to be what fuels Ethiopian distance runners. It is high in calcium and vitamin C and is gluten free. White or ivory teff is the mildest, while darker, brown teff has an earthier taste, but all varieties have a sweet and light flavour. Buckwheat is actually the seed of a plant that is part of the rhubarb family. It has been a staple part of the diet in Eastern Europe, Japan and China for centuries. Like amaranth and quinoa it’s more of a seed than a true grain, but it’s treated like a grain in cooking terms. Buckwheat has a deep satisfying nutty flavour. (It is used to make soba noodles) but can be used as you would any other grain in soups, stews and salads. It can also be mixed with oats as a sustaining and protein-rich porridge. The flour makes the most delicious nutty pancakes too. Buckwheat is usually found roasted and dried. It is available in all good health food stores. Buckwheat soba noodles are widely available in most supermarkets. Millet is a versatile grain that originated in Africa but has long been a staple in Eastern Europe as porridge; in India it’s ground into flour to make flatbreads called rotis. Millet has a mild nutty flavour similar to quinoa but a little drier. Millet can be used in place of rice, or any other grain. A jar of olives forms the base of a lot of dishes I cook. I like the fat green ones or the kalamata black ones. Chopped into a simple tomato pasta, chopped into a quick tapenade, added at the end to a tray of roast veg so they crisp up or just marinated in good oil citrus zest and some coriander seeds for a quick thing to snack on. They keep well in the fridge for a few weeks once opened too. Brindisa always do amazing ones. Capers are such a quick way to add flavour, acidity and punch. Be it to be a classic puttanesca, or (game changer) fried in olive oil until crisp and then sprinkled on pasts, soup, stews, roast veg. I buy the small nonpareille capers in brine, because they are quite acidic I think small is bets, if using the big ones then i’d chop them up a bit. If you have salted ones then make sure you give them a good wash or even a soak in cold water to get rid of the saltiness. They keep well in the fridge for a few weeks after they are opened. So versatile and useful to have in your store cupboard, I always have a few tins of good organic tinned tomatoes on hand, San Marzano tomatoes are the best, sometime I use tinned cherry too for an extra sweet tomato sauce. They may sound basic, but simmer them with a load of spices and herbs and you have a simple stew. I ry and keep a jar of roasted red peppers on hand, the Spanish ones are the best (navrrico). They add a quick flavour boost to almost any salad., stew or soup. I find them particularly useful in winter when seasonal produce lacks the full summery flavour that they bring. I use them to make a quick romesco sauce or to chop into a salsa too, great chopped into a frittata or added to scrambled eggs. I love this series and part 1 has inspired my afternoon grocery shopping! Thanks for sharing ideas to use the ingredients and create amazing meals and snacks!! Thanks for this. Got your seasonal cook book for Christmas. Love it. But was a bit daunted by the ingredients used in some of the recipes. Actually sat down and went through them to compile a storecupboard list. This is such a help. Thank you Anna for your wise suggestions. You are an inspiration. About coconut oil I really can’t stand the “tropical taste” but it is very hard to find no taste version in HK where I live now! Do you know any “trusted” brand selling no taste that ship at reasonable cost world wide? Thanks, never knew about chick pea pasta, where do you get it from ? Great list and I found it really helpful that you list the brands that you prefer as it can be so confusing and daunting. I’m going to hunt them down now. Any recommendations on somewhere to buy many of them in one place?